The large diameter of PipeHugger ensures pressure pulsation dissipation. Liquid in bladder, gas in drive bonnet enables low cost construction. GO TO Lost Motion Pump with HP PipeGuard PiG-HP, Slim & tall for max. economy. Stainless vessel externals for corrosive environments. Gas bag accumulator goof for flow fluctuation smoothing. GO TO Packed Plunger Pump Page - color schematic connected to HP & LP PipeHuggers, gas in bag & liquid in shell. FLOW-THRU. 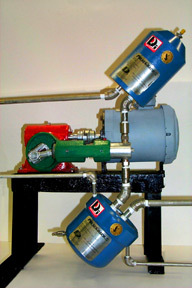 A DAMPER SAVES FLOW REVERSAL ENERGY LOSS.